Saturday was a long day for me and in some ways a difficult day. I learned early in the morning as I was doing write-ups that the amazing Tammy Moyer of News 1130 just passed. Before I start, I just wanted to acknowledge this amazing local icon who touched so many lives. Tammy you will be missed. Article HERE. Next came a favourite for me. 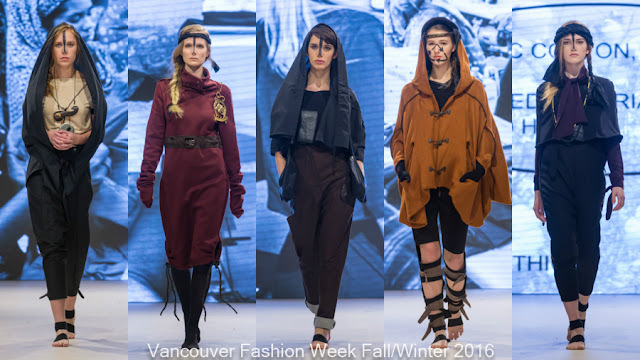 In 18 seasons of covering Vancouver Fashion Week (VFW) I have only made time for an interview while shows were running twice. Why - I am stretched to my limit all week. BUT I made an exception again yesterday to have a chance to sit with French designer Eymeric Francois who blew us all away with his Midnight in Paris collection (review HERE). What a positive force of nature and what an amazing story. I really am blessed to do what I do. Then it was time for the day. 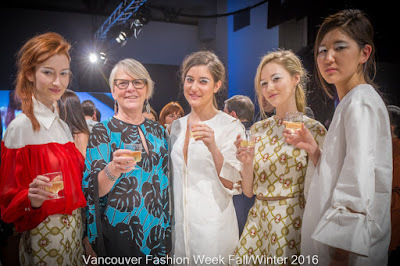 My outfit was a great turquoise/black print blouse I from Holt Renfrew Vancouver that I purchased during a charity fundraising event held in-store. My leather look/knit black skirt is by local designer Jac by JC. I love wearing local and encourage all of you to put at least one item in your closet each season made by a Vancouver designer. 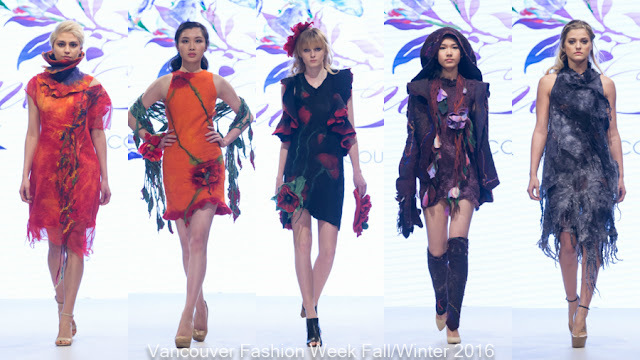 You can check out my BUY LOCAL column to see some of the local designers showing this week at VFW. language of the coastal-dwelling Wappo and Yuki tribes, pays tributes to its origins. Now on to the shows. I'm beginning to sound like Tim Gunn, but yesterday again had such a strong group of shows and such a diverse set of styles that choosing who to cover was brutal. I will be offering a few side articles to fill in, but for today I went with some very unique choices - two eco designers, a Gatsby collection and a unique menswear designer. Enjoy! Designer Lima Jordan has had an international journey to this moment. She was born and raised in Germany where she was surrounded by art and music. She earned a degree in fashion design in London. Now based in Melbourne, Australia, the designer has created a signature label inspired by the concept - Creation of Imperfection. 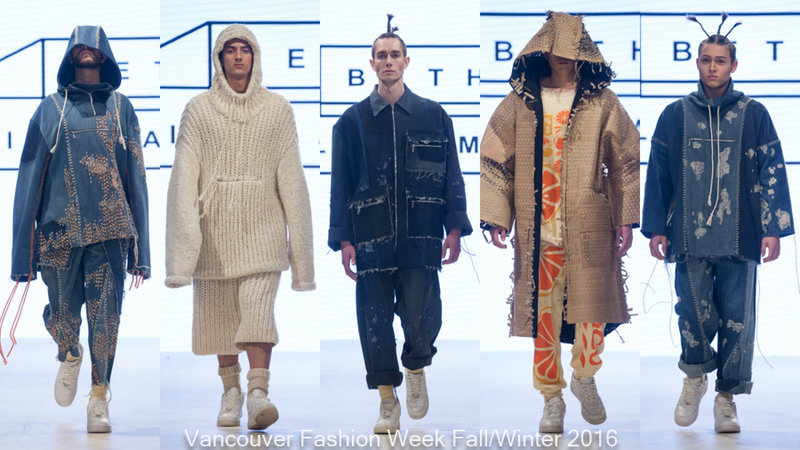 It embraces slow, sustainable fashion. 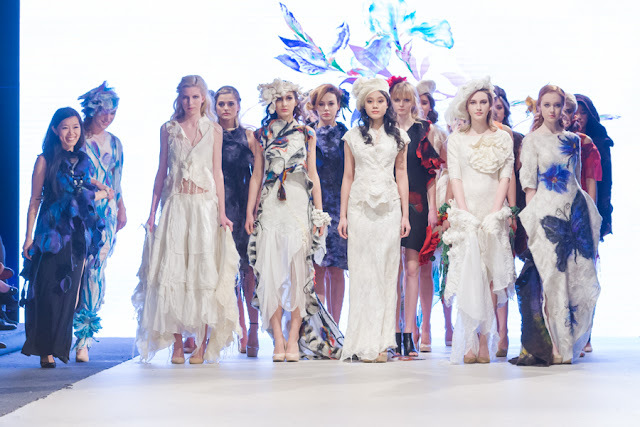 In fact she refers to her designs a provocative anti-fashion. From the designer's bio, "Thinking away from a disposable society and challenging the accepted norms; Lima Jordan transforms Sustainability, Simplicity and Practicality into raw avant-garde fashion. Inspired by nomadic tribal lifestyles, a controversial combination of rich natural tones, asymmetrical cuts, masculine elements and over-sized layers are linked by stark black. This trademarks her work and reflects the absorption of color and anonymity...For her, fashion is a form to communicate respect to each other and our environment." Jordan chose to feature a video promoting slow fashion as a background that showcased the poor working conditions of those working in today's garment trade. It was a powerful statement. Looks on the runway were in a darker natural palette with a definite tribal influence right down to the hair and make-up. Bare feet were wrapped in black tape - an interesting note. Emcee Symone Says mentioned the sheer number of hours that went into making this collection and it was enormous. London-based menswear designer Bethany Williams is a recent graduate from London College of Fashion (LCF) and had showcased her collection on the runway at the London Collection Men (LCM). From the designer, "We believe that social and environmental issues go hand in hand and through exploring the connection between these issues we may find innovative design solutions to sustainability.We want not just to comment on a community, but work in their social spaces to try to create a change through furthering economic gain for charity. By using social capital, intellectual and labour intensive skills we aim to create a profit, which will be given to connected charities, continuing the cycle of exchange." The collection showcased last night was called Breadline. This eco line was created using waste materials, plus recycled cardboard and ‘Tesco everyday value’ branded organic prints, all donated by Tesco. 30% of profits to The Vauxhall food bank, continuing the cycle of exchange. They worked with local crafts people using traditional hand techniques to create hand crafted woven, printed, knitted and embroidered materials. Every garment is 100% sustainable and made in the UK, right down to the buttons. 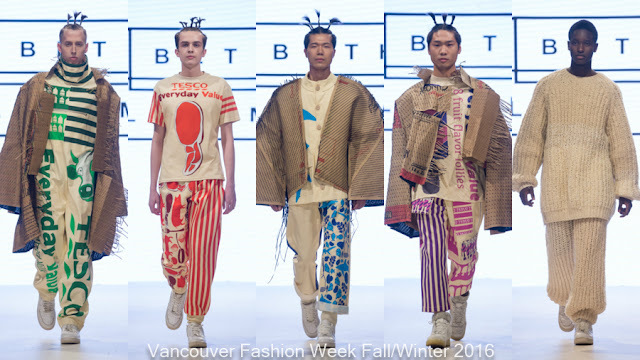 I love seeing shows that challenges our concepts of what fashion should be, that has a socially responsible focus and that offers unique ideas. This show had all three of those elements. Well done. 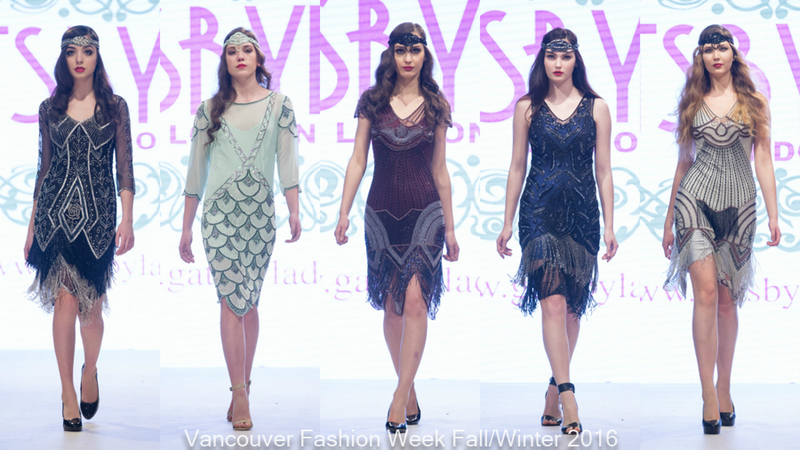 Gatsbylady London designer Rojda Hoda started sewing and designing clothes when she was a little girl. She went on to learn every aspect of sewing and pattern making while working in factories and then earned a postgraduate degree at the University of London and a MSc degree in fashion from a leading university in Great Britain. What followed were many years working for others in the high fashion industry, but her long held dream of having her own label could not be denied. From the designer's bio - "What sets Gatsbylady apart is the quality of fabrics, unique hand embellished designs and the flexibility of their fits. Their designs are individual, effortless, comfortable and stretches by a size for an easy fit. They cover from a UK size 0 to UK size 30 and also do the Petite range and Tall Range , so there is no matter of size and shape with Gatsbylady." I had this show mentioned to me by one of the organizers, but didn't know what to expect from the name. When the great "Gatsby" music started and the first model hit the runway in a sparkly dress inspired by that period, I wondered if the collection would cross that fine line into costume-y. Not a chance. The design work, construction and bead work were all first rate. There were several dresses I would actually love to wear which is surprising as I'm not really a girlie girl in any way shape or form. The show was fun and upbeat and the response from the audience all around me was overwhelmingly positive. 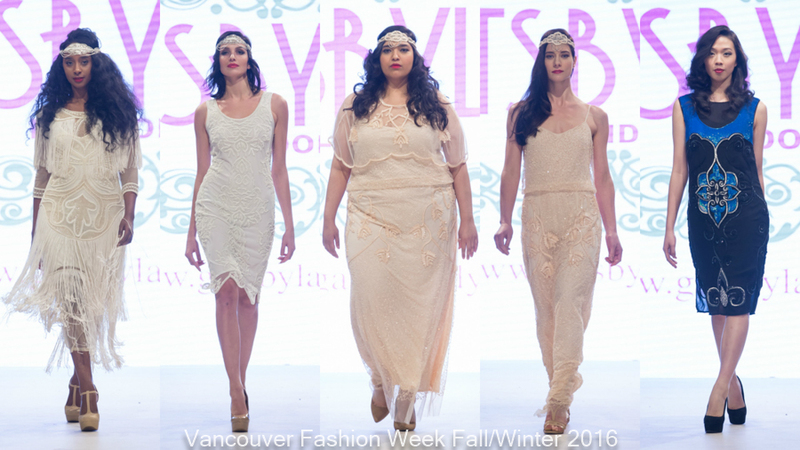 One note - I loved the designer's choice to show these dresses on a wide range of body types. Every model looked fabulous! KUDOS! I hope you return next season Rojda! I purchased the shawl in the middle picture after this show and wore on Sunday - it's fabulous! Toronto Designer Elina Ten's roots are in Korea and Kazakhstan, but she is a Canadian discovery, producing fine wearable artwork from her Richmond Hill 3D Art Design Studio. 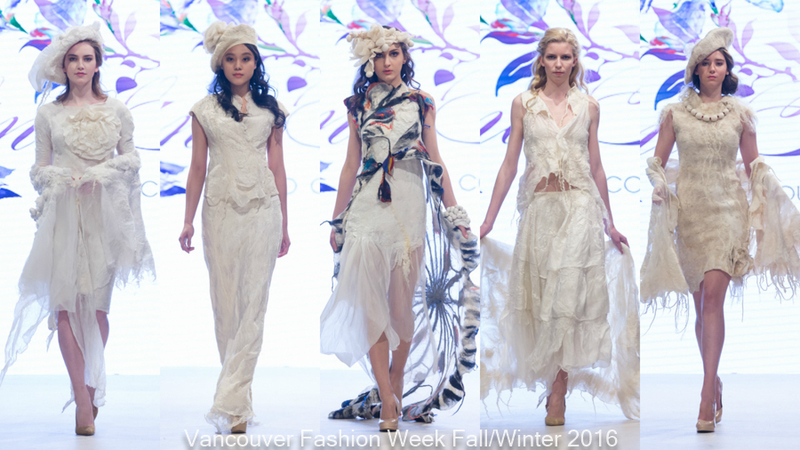 Her work has been shown at Eco Chic Fashion Show, sponsored by United Way, Hope in the City, Canadian Cancer Society, The Wearable Art Show, One of a Kind Show, Fall Fling Fashion Show, Affair With The Arts Fashion Gala and many others shows. 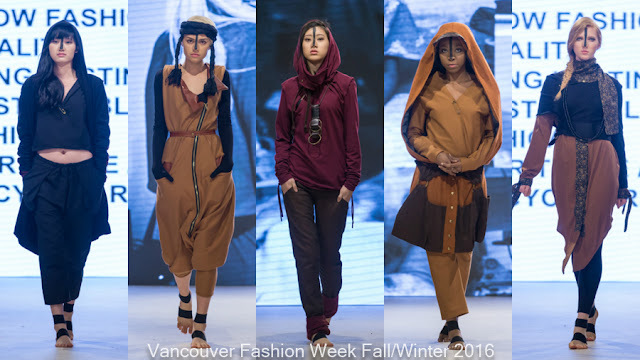 Has been invited at Western Canadian Fashion Week celebrity collection. Ten brought her amazing Eco Couture collection to the runway last night - creations combining silk and raw fine wool, incorporating ancient silk art and Nuno Felting techniques, to produce an exquisite array of colour, texture and emotion. Each garment is a beautiful piece of art with many that can be worn several ways. From the designer, “My Eco Couture fibre textile artwork from silk and raw fine wool are wearable, warm and delicate, without any seams, reversible and unbelievably soft. They are also thin and the shear has an airy texture and a sensitive dialogue of eco friendly materials” – says Elina Ten. I happened to notice this collection when passing through backstage and instantly fell in in love. 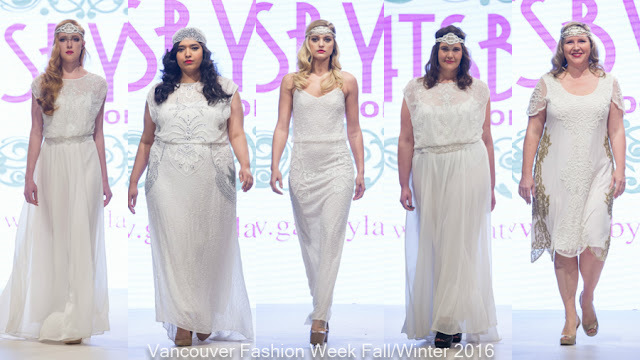 Looks were soft and beautiful - floating down the runway. What a show to open the night with. One shawl in particular called my name and I couldn't resist. It's now a part of my collection and I'll be wearing it tonight hopefully.